Hey everyone, had a busy week here picking up a couple new jobs, but I will try to get some more regular postings. 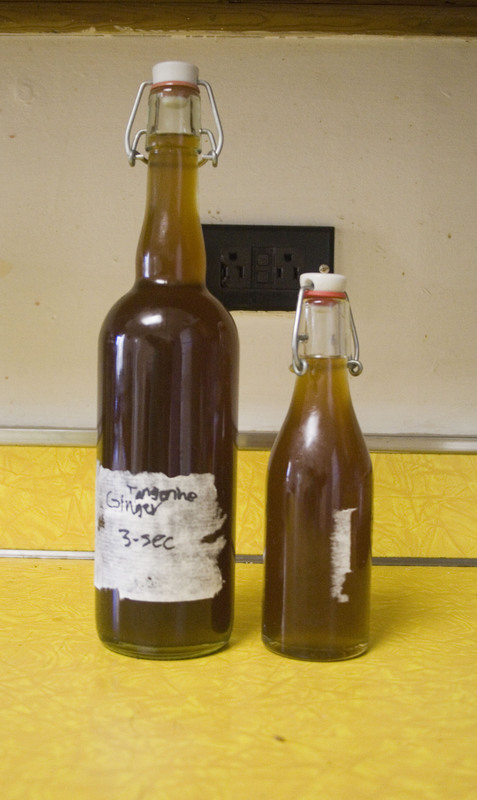 Without further to do, here is a recipe for some homemade triple sec/citrus liquor. Honestly, calling this triple sec is a bit insulting to it, it’s more similar to an orangecello, though even that isn’t quite right. For this batch I used the peels of organic murcott tangerines that I got from a local farmers market. I usually use dried peels as they have an indefinite shelf life; these peels were from last summer/fall. I finished this batch off with some of the ginger simple syrup I cooked the previous week to create a tangerine-ginger triple sec. Read on and try it yourself! This is a FLAME HAZARD. If you are not careful watching this and you are cooking on a stove top like me, without a real still, there is a very real chance of it catching on fire. Vodka is definitely flammable, and orange essential oil is extremely flammable. Combine the two and it is a recipe for a giant 2 foot tall pretty blue flame, like I saw when mine caught on fire the other day. This is my fourth or fifth time doing this now and first fire. The fire is VERY easy to put out, even easier than it is to start, just put a lid on it and turn the heat off. It is seriously that easy and you don’t ruin your triple sec. This was honestly the best batch I have ever made. 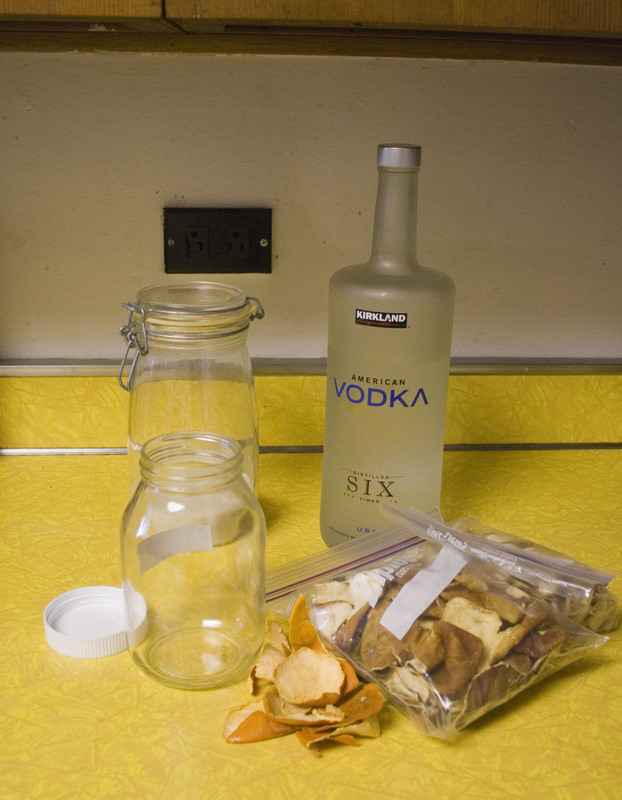 You will need: An empty jar, vodka or another neutral spirit, sugar, and orange peels (fresh or dried). If you plan to dry your peels to use them make sure they are TOTALLY dried out, or they will mold. I’ve lost peels to that before. Step 1: Fill your empty jar with orange peels, don’t cram it full but put as many a you can comfortably fit. Fill the empty space with vodka and leave it for 1-2 weeks. One week is enough to infuse the orange essential oils into the vodka, but an extra week doesn’t hurt. Step 3: Pour out your orange peels and vodka into the pot that you will use to cook in. 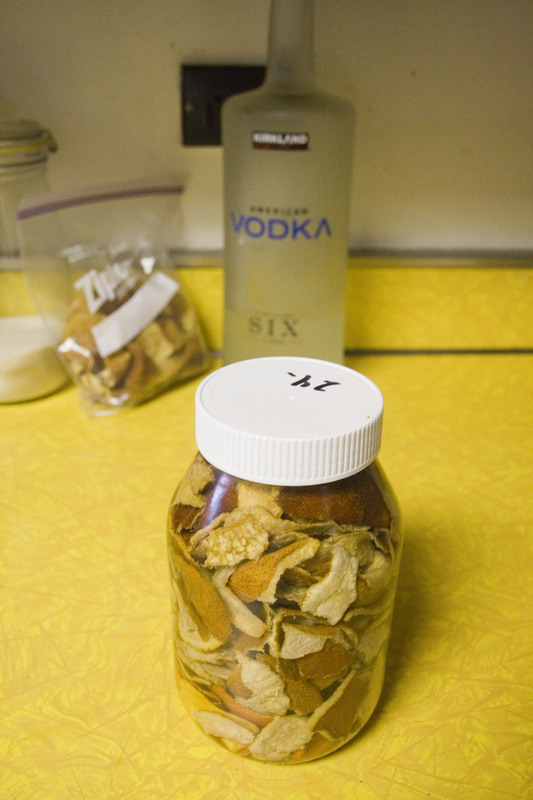 Squeeze residual vodka out of the peels into the mix and add some more vodka to cut down the strength of the flavor. 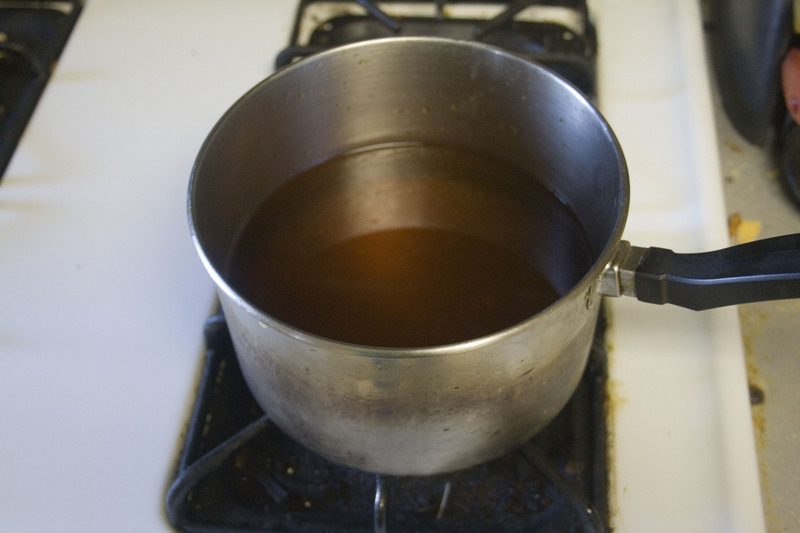 Step 4: Bring to a boil covered, then uncover and stir quickly. BE CAREFUL NOT TO SPILL ANY! 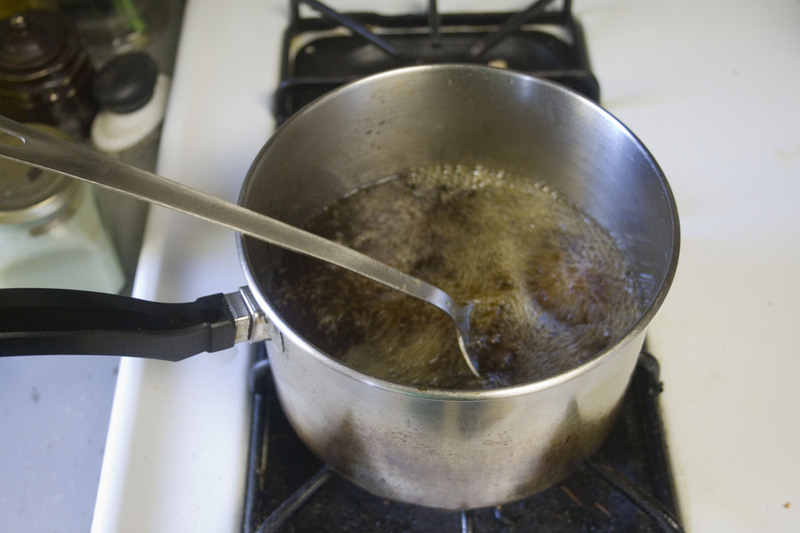 Alcohol and orange essential oil are both super flammable, spilling any while cooking is almost a guaranteed cooking fire and no one wants that. As an aside, the giant blue flame I made was very pretty. Here is what the finished product looks like, very dark in color compared to usually bland and colorless triple sec. The flavor is rich and multilayered, perfect for sipping by itself or using in a cocktail. If you are interested in some more awesome recipes check out Punk Domestics. That “Last Gasp of Summer” sounds awesome.